With 3 Different Web Mail Solutions brows YOUR Private Web Mail Server. Configure password-protected directories, IP Blocker, SSL/TLS, and GnuPG key settings to restrict access. within account can create multiple account which be under the main domain ex. (subdomain.yourdomain.com). Edit and backup files and folders while monitoring your website’s disk space usage. Take advantage of third-party software (Softaculous) for blogs, bulletin boards, guest books, eCommerce, and more to build a robust, dynamic site. With ftp account files transfer via web browser or Ftp Application Clients. 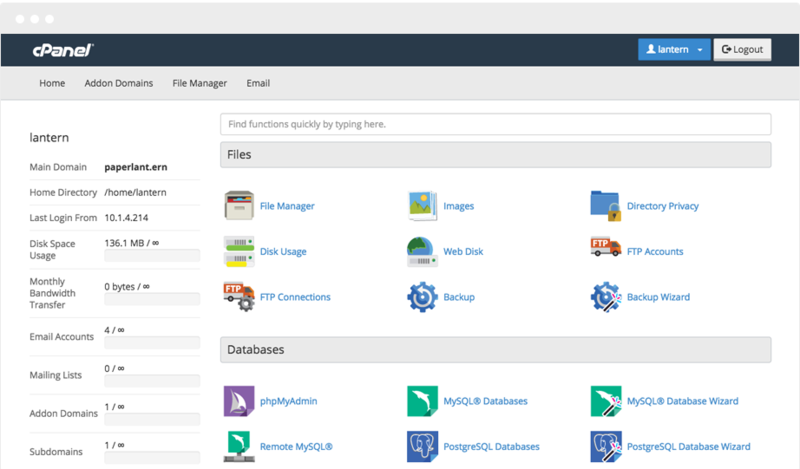 with PhpMyAdmin, MySQL@Databases Store large amounts of data and limit access using MySQL and PostgreSQL databases. with the lasted version of server-side scripting language (PHP, PHP PEAR Packages, Perl Modules, RubyGems, etc). Know your audience and track your website’s performance using Webalizer (view all web site statistics), Bandwidth files transfer, and AWStats. 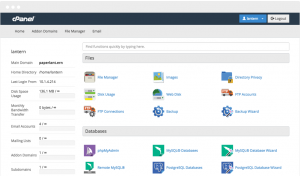 cPanel The Most popular web admin control panel, Linux based web hosting control panel that provides a graphical interface and automation tools designed to simplify the process of hosting a web site. Application-based support includes Apache, PHP, MySQL, etc. Email based support includes POP3, IMAP, SMTP services.